At Osborne Painting, your expert exterior painter in Raleigh, we pride ourselves on being able to not only provide our customers with the absolute best quality paint job but also providing the knowledge and experience that comes with over 20 years working in the painting industry. One of the most common questions we encounter: how to paint my home’s brick exterior? Brick is a very common construction material in North Carolina and has been since the earliest days of European settlement. Due to the abundance of local clay (and oyster shells nearer the beach), North Carolinians have never wanted for bricks. In fact, North Carolina was once the top brick producing a state in the union. What this means in practical terms is that many homeowners in Raleigh are faced with the conundrum of whether or not to get exterior painting for their brick homes. Whether you’re looking for a change from a dull yellow color, or in search of a crisp and classic white look, changing things up is definitely something worth looking into. If you’re on a budget, there are numerous options that may work well for you. To begin the project, we will thoroughly clean the exterior of your brick house by using our proven techniques. Heavy-duty disinfectants such as trisodium phosphate and diluted bleach may be needed in order to remove stubborn efflorescence (white residue from deposits of water-soluble salt buildup) and mold, respectively. Also, waiting for at least 24 hours or more (depending on your climate) will allow the brick to dry fully, which is worth keeping in mind. 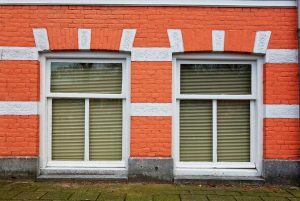 What Are The Pros of Exterior Brick Painting? For reasons that we will mention below, many people hesitate to get exterior painting done on their bricks. For this reason, painting them can be a bold fashion statement. It can also change the architectural appearance of your home to something less colonial. Despite what some may think, unpainted brick is generally low maintenance. Because it is durable and doesn’t bubble or peal in tough weather conditions, it is a top choice for those who are in search of a historical and classic look and feel. Upkeeping painting brick is not as tough and tedious as some seem to think. Upkeep timelines vary, so be sure to talk to your Raleigh exterior painter to determine which route is best for you. Because bricks are made from a kiln-fired assortment of shale and clay (which happens to be naturally porous), it is durable and tough to harm. the porous bricks are able to breathe, expelling moisture after a harsh storm or snowfall. In areas that experience heavy snowfall and/or freeze-thaw cycles, brick is said to be one of the best options to avoid any inconvenient setbacks. Osborne Painting understands that importance of using suitable and high-quality, vapor permeable paint, rather than just run-of-the-mill paint that will likely trap moisture and cause your bricks to being crumbling. The trapping of moisture is often one of the most difficult deterioration processes to spot, simply because the issue will begin while hidden beneath the paint. Who said that exterior painting had to be just on the bricks? One of the best options we’ve found for exterior painting in Raleigh is using a contrasting color on the trim, shutters, doors, and window sills of your house. Our expert exterior painting contractors can assist you in color choice, but we would recommend looking at a color wheel to decide what would best complement your brick color. Depending on your location, the appearance of unpainted brick may jar with either the appearance of your neighbors’ houses or the local flora. In these cases, it might be in your best interests to consider some form of exterior painting. Unpainted brick is a surprisingly durable material, which tends to make it a very low-maintenance option for homeowners. Painting it means that, just like other homeowners, the owner will need to get exterior painting done every seven years or so. 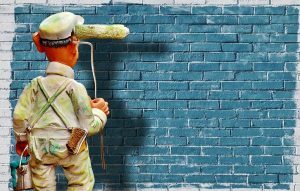 Painting brick also reduces its breathability, meaning that you will more frequently have to check for damage under the paint. While this could theoretically fall under “Increased Maintenance” we felt it deserved its own section for emphasis. Painting your brick exterior means that any time you want to repoint the mortar, replace bricks, or anything of the sort, you will need to repaint. Now, this is not significantly different from what normal homeowners have to deal with, but homeowners who have had unpainted brick up until this point might be unfamiliar with it. If you do decide to paint your home’s exterior brickwork, do yourself a favor by realizing you’d be making a serious commitment. If you change your mind after the painting project is complete, you will be faced with a time-consuming, tedious, and pricey ultimatum. There are numerous and required chemical and sandblasting treatments that could likely damage the brick in the process. As the owner of Osborne Painting, Anthony “Tony” Osborne is often on the job, ensuring first-hand that you get the quality service and workmanship you expect from our company name. When you contract with Osborne Painting for your next Raleigh exterior painting, interior painting, or home improvement project, you will work with the same friendly faces until the job is completed to your satisfaction. Whether you choose Osborne Painting for Raleigh interior painting, exterior painting, pressure washing, cabinet refinishing, or any of our other home improvement services, you can rest easy knowing you’ve chosen a company committed to quality, at the fairest of prices. We take our promise to provide “Quality Work, One Step at a Time” seriously. At Osborne Painting, we don’t take shortcuts. Whether it’s cleaning, preparing, sanding, caulking, priming, or painting, all steps are completed before moving on to the next. We’ll take the time to get the job done right. If you’re searching for the best painters in Raleigh, NC, be sure to take a look at our client testimonials to see for yourself just how satisfied our customers are with the quality workmanship and customer service they receive from the premier Raleigh painter. If you have read through all of this and want to contact a Raleigh painter to paint the exterior of your brick home, Osborne Painting is your company. Our expert contractors are exactly the sort of people you want doing a project as complicated as painting brick home exteriors. If you would like to learn more contact us using the form below or call us at 919-878-6611 today! How Do I Know It’s Time to Change Out My Gutters?